US First Lady Michelle Obama amazes me. I must confess that I only know a little about her from what I read in the newspapers. But whatever little I have read, she is really amazing. I know she loves to dress elegantly. I am aware she didn’t approve when someone tried to market baby dolls designed after her daughters Sasha and Malia. Also, I remember having read that she wants them to keep away from celebrities visiting the White House. She is so caring and protective like any mother, wants her children to grow up with as little influence of the White House as possible. Admirable, isn’t it? I must admit I was completely bowled by her latest initiative. That the first lady is laying out an organic vegetable garden in the White House, which will be the first since Mrs Eleaner Roosevelt planted a ‘victory garden’ some 60 years earlier, my admiration for her grew manifold. “I want to make sure that our family, as well as the staff and all the people who come to the White House and eat our food, get access to really fresh vegetables and fruits,” she was quoted as saying. Newswire agency Reuters reports that the garden will produce up to as many as 55 different fruits and vegetables. The garden, which will be organic, will be planted later in the spring and will include berries and mint. It is being started as the country faces an epidemic of obesity and diabetes. The link between organic food and obesity/diabetes is very vital. I am sure Mrs Obama’s efforts will send the right kind of signal considering that over 400,000 people die every year in the US from obesity and its fallout, much of it the result of unhealthy food (and lack of exercise) that they are forced to eat. Yes, I am talking about industrially-farmed and factory produced junk food that people have become so accustomed to. They don’t even realise that the food they are being made to eat is unhealthy and can be a potential killer. Before I analyse the broader implications of Mrs Obama’s initiative, let me first say how envious I feel about Americans. No, it is not the bland and junk food that I crave for. I am happy with the traditional Indian food, and I must say I have a wide variety to choose from. But what makes me envious is that after long the US has got a first lady who really cares for healthy food. How much I wish the Indian Prime Minister’s wife, Mrs Gursharan Kaur, who I see inaugurating an exhibition here and there or attending a book launch, had also drawn the nation’s attention to healthy food. Nor do I ever see the UPA president, Mrs Sonia Gandhi, trying her hand at organic farming, growing vegetable in her heavily guarded and sprawling garden house. And what about the successive lineage of India’s Presidents? They all lived in opulence, in a massive Presidential estate called the Rashtrapati Bhawan. None of them, and that includes the former President Abdul Kalam, ever tried their hand at growing fruits and vegetables. If any of them had thought of setting up an organic garden, believe me Indians would have followed the trend by setting up kitchen gardens at least on the terraces and other empty spaces. But then, we were not so lucky. No one inspired the nation to grow safe and healthy food. Coming back to the US, while I appreciate Michelle Obama’s initiative, I wonder why does the US President not think on the same lines. Organic food is not only healthy for those who live in or visit the White House. It is healthy for all Americans. Why can’t Mr Obama therefore make sure that Americans too eat healthy food, grow organic and eat organic. His mandate runs beyond the White House, and I am sure if he decides to do so he can turn America into a healthy and ecologically safe nation, and at the same time set a precedence for most other Heads of State to follow his example. Growing organic would also reduce dependence on fossil fuel, is environment friendly and reduces global warming by at least 30 per cent. What more can you ask for, Mr Obama? Am I am dreaming too much? Or you feel I am thinking of an utopian dream which cannot be realised? Well, let me tell you categorically, this is easily possible. All it needs is a firm resolve from a leader who thinks he can. — Clarence Thomas, one of the Supreme Court Judge who voted for the legality of George Bush’s election, was Monsanto’s lawyer. — The U.S. Secretary of Agriculture, Anne Veneman, was on the Board of Directors of Monsanto’s Calgene Corporation. — The Secretary of Defense, Donald Rumsfeld, was on the Board of Directors of Monsanto’s Searle pharmaceuticals. — The U.S. Secretary of Health, Tommy Thompson, received $50,000 in donations from Monsanto during his winning campaign for Wisconsin’s governor. — The man in charge of overseeing the GMO evaluations at the FDA, Michael Taylor, was not a scientist but a lawyer who had previously represented US biotechnology giant Monsanto. After leaving the FDA he went back to his private practice, eventually becoming Monsanto’s vice president. — The US Center for Responsive Politics points out that this is a classic case of the revolving door syndrome, the conflict of interest caused by the constant movement of professionals back and forth between the private and public sectors. Does Mr Obama know that Michael Taylor – the man who forced genetically engineered rBGH on US (unlabeled so us, unaware) when the Clintons placed him over “food safety” in the 90s (as mentioned above) – is back in government, this time to act with massive police power as a “food safety tsar” from inside the White House? Does he know that a new food safety bill — HR 875 — would gradually outlaw organic agriculture? Shouldn’t Mrs Obama be equally worried? 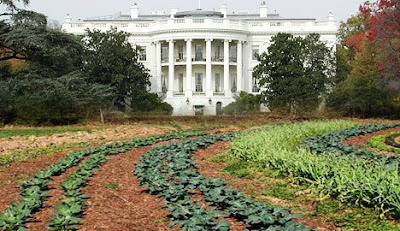 If GM food is ‘substantially equivalent’ to organic food, I am sure Michelle Obama wouldn’t have felt the need to lay out an organic garden in the White House. ually push farmers out of agriculture, and at the same time make organic agriculture illegal. If the bill comes through, Michelle Obama must know that by the time Mr Obama is ready to face his 2nd term, US farmers would have become extinct. This is the time for Mr Obama to apply brakes on this bill. If he doesn’t take this seriously enough or is taken for a ride by the USDA officials and the agribusiness companies, which work hand-in-glove, it will be too late. In the years to come, food will be produced entirely by the corporations, and the first and foremost casualty would be that safe and healthy food will disappear. Organically produced food would be outlawed, which means you wouldn’t be able to grow it even in the White House. Well, Mrs Obama, you are an amazing person. You are not only the first lady but also carry a mother’s heart that always tries to provide safe, healthy and non-contaminated food to children. You ensure your kitchen is clean, your cutlery is clean, the children wash their hands before they sit on the dining table — all this to ensure proper hygiene lest your children fall sick. This mother’s instinct is what the American nation needs. They too need safe and healthy food that is grown in their own backyards, and grown organically without harmful chemicals and unwanted and risky genetic modification. I hope America remains in safe hands. Only you can ensure that.